Reading UK. June 30, 2017 – IGEL, a world leader in the delivery of powerful unified endpoint management (UEM) software, thin clients, zero clients and all-in-one solutions, today announced that Ayrshire College has invested in virtual desktop infrastructure (VDI) to support the move to its brand new £53 million campus in Kilmarnock. Built on the site of a former Johnnie Walker whisky bottling plant, the land for the 10-acre campus was gifted to the College by Diageo to help regenerate the area and is now home to 338 staff and 5,500 students who study over 100 courses. 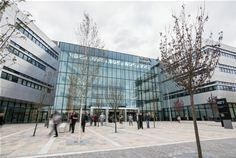 The new campus was officially opened in December 2016 by Scotland’s First Minister, Nicola Sturgeon, and is one of three main campus locations operated by the College. For example, students studying for an HND in Beauty can now bring a laptop into a salon and work on a presentation or type up their notes. Previously IT wasn’t available in these learning spaces and they would have to go elsewhere such as the Learning Resource Centre. The use of IGEL thin clients is perfect in a classroom context. They are compact, quiet, produce a minimal amount of heat and consume less power which helps with the College’s green initiatives. Ayrshire College has taken advantage of IGEL’s UDC software and loaded it onto 400 laptops to convert them into thin clients. These are stored in twenty rooms – called IT enabled labs – which have 20 laptops each housed in two cabinets. A lecturer has the keys to the cabinets and controls lending the laptops to students so they can do group work, research, theory and so on. IGEL thin clients are robust, and, using IGEL’s free Universal Management Suite (UMS), easy to set up, configure remotely and manage day to day with support requests able to be dealt with quickly. The Kilmarnock Campus is phase one of the approach to deliver IT flexibility throughout Ayrshire College. Based on its success, the aspiration – subject to funding – is to introduce Citrix and IGEL across not only the three campus sites, but additional satellite locations which offer courses such as motor vehicles and horticulture, so that all students are given the software they need when, where and how they want it.